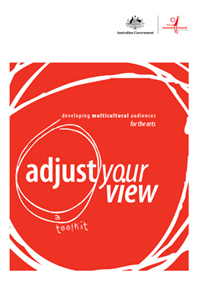 Adjust Your View is essentially a toolkit of ideas and steps intended to provide a framework for the development of multicultural marketing strategies for the arts and cultural products. It also provides local and overseas case studies which may be inspirational in building audiences which mirror Australia’s culturally and linguistically diverse population. These case studies are not definitive but are indicative of best practice in multicultural audience development. Discussion of some of the most evident missed opportunities in the area of diverse arts marketing is included, because it helps in understanding obstacles and pitfalls which can be avoided. Multicultural marketing is not rocket science. But it is complex and needs passion, commitment and a willingness to learn. This toolkit is divided into four sections and each section can be used as a stand-alone component or be integrated to assist in attracting multicultural audiences to arts and cultural events. Context is important in framing some of the discussions and theories which may be used in multicultural audience development. This section examines the types of people which need to be enlisted when expanding multicultural audiences. These ‘archetypes’ may be found within your organisation, or generally within the community. The nuts and bolts of a realistic marketing/communication strategy aimed at multicultural audiences. Here you will also find some audience profiles of real people and tips on how to conduct focus groups, profiles and research. Sydney Symphony Orchestra: Developing a new Asian market for traditional canon of Western classical music. Mix it Up – An evolving partnership. Carnivale Multicultural Arts Festival: Rebranding for a new audience. USA: Bring in ‘da Noise, Bring in ‘da Funk at the Joseph Papp Public Theater, New York City. USA: Abrazando La Diversidad / Embracing Diversity; Museum of Contemporary Art San Diego (MCASD). Netherlands: Theater Zuidplein’s Multicultural Program Committee.